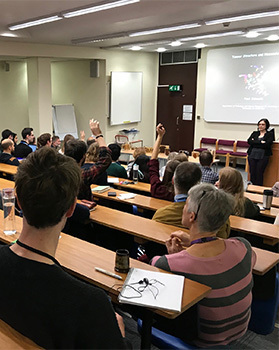 All first year CRUK Cambridge Centre PhD students are required to attend the Lectures in Cancer Biology and Medicine series. The talks aim to give a general introduction to cancer biology and medicine and all students and staff are welcome to attend. Please click on the lecture title to access the slide presentation from the lecture - these are for personal reference only; please contact the speaker if you would like to use any of the information in their presentations. Thursday 18 April: Dr Charlotte Coles, (University of Cambridge) Breast Cancer Programme and Hilary Stobart. Thursday 25 April: Dr Walid Khaled, Department of Pharmacology. Thursday 2 May: Dr James Brenton, CRUK Cambridge Institute and Professor Paul Pharoah, Centre for Cancer Genetic Epidemiology. Thursday 9 May: Dr Grant Stewart, Department of Surgery, Cambridge University Hospitals NHS Foundation Trust. Thursday 23 May: Mr Vincent Gnanapragasam, Department of Surgery, Cambridge University Hospitals NHS Foundation Trust. Thursday 30 May: Mr Thomas Santarius, Cambridge University Hospitals NHS Foundation Trust. Thursday 6 June: Dr Harry Bulstrode, Neurosurgeon, Department of Clinical Neuroscience. Thursday 13 June: Dr Amos Burke, Clinical Consultant - Department of Paediatric Haematology, Oncology and Palliative Care. Thursday 27 June: Dr Marc de la Roche, Lecturer - Department of Biochemistry. Thursday 4 July: Dr Robert Rintoul, Clinical Consultant, Cancer Research UK Cambridge Institute and Dr Frank McCaughan, Wellcome Trust Intermediate Clinical Fellow / Honorary Consultant,Department of Biochemistry School of Clinical Medicine. Thursday 11 July: Mr Raaj Praseedom, Consultant HPB-Transplant Surgeon, Lead clinician for the East of England Specialist HPB Specialist Multidisciplinary Team. Thursday 18 July: Dr Barry Davies, Director, Clinical and Translational Scientific Alliances, AstraZeneca. "The AKT inhibitor Capivasertib (AZD5363): from discovery to clinical proof of concept"
Thursday 25 July: Dr Matthew Murray, Academic Consultant Paediatric Oncologist. Dysregulated metabolism: passenger or driver of cancer? DNA repair: translating mechanistic insights towards new cancer therapies. For details of talks up to the end of July 2019 and for last minute changes, please see the series listing on the talks.cam website.